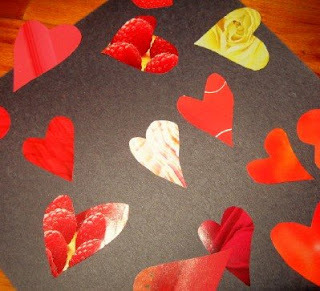 Embellish your valentines with hearts cut from magazine ads. I'm not too cheap to buy Andrew the super-cool holographic Transformer cards, but he insisted on making his own. For more sophisticated Valentines, Monica has great instructions for making magazine envelopes here. 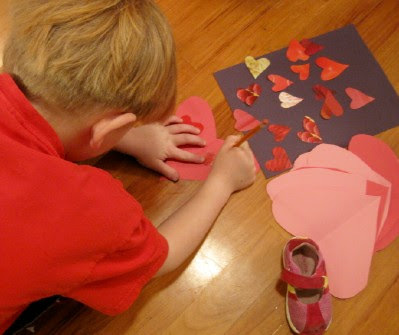 For all the years my kids were growing up, we made valentines from whatever was handy around the house, including doilies, flowers cut out of seed catalogs, construction paper, ribbon, etc. We homeschooled, so the kids gave them to each other and mailed them to special friends. I'm impressed that he'd rather make them himself rather than buy. You're raising him right, my dear!